Definition at line 116 of file Pool.h. Definition at line 84 of file Pool.cc. Main cleanup handler. For MemPools to stay within upper idle limits, this function needs to be called periodically, preferrably at some constant rate, eg. from Squid event. It looks through all pools and chunks, cleans up internal states and checks for releasable chunks. Between the calls to this function objects are placed onto internal cache instead of returning to their home chunks, mainly for speedup purpose. During that time state of chunk is not known, it is not known whether chunk is free or in use. This call returns all objects to their chunks and restores consistency. Should be called relatively often, as it sorts chunks in suitable order as to reduce free memory fragmentation and increase chunk utilisation. Suitable frequency for cleanup is in range of few tens of seconds to few minutes, depending of memory activity. maxage Release all totally idle chunks that have not been referenced for maxage seconds. Definition at line 224 of file Pool.cc. 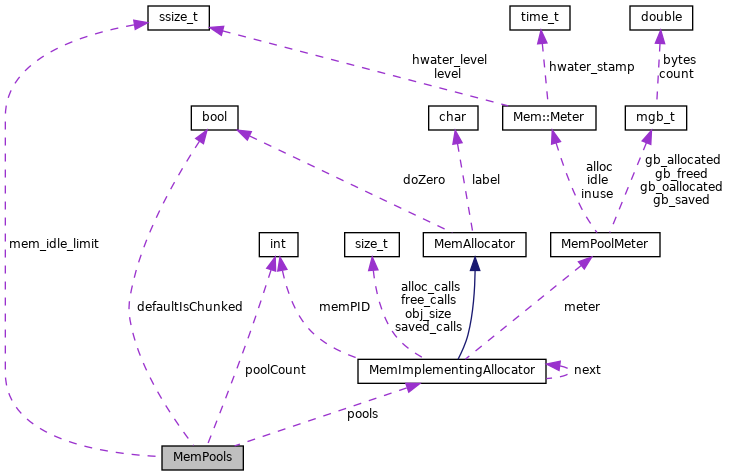 References MemImplementingAllocator::clean(), Mem::Meter::currentLevel(), flushMeters(), MemPoolMeter::idle, MemImplementingAllocator::idleTrigger(), mem_idle_limit, memPoolIterate(), memPoolIterateDone(), and memPoolIterateNext(). Referenced by Mem::CleanIdlePools(), and memClean(). label Name for the pool. Displayed in stats. obj_size Size of elements in MemPool. Definition at line 91 of file Pool.cc. Definition at line 174 of file Pool.cc. References MemPoolMeter::alloc, mgb_t::bytes, mgb_t::count, Mem::Meter::currentLevel(), MemPoolMeter::flush(), MemPoolMeter::gb_allocated, MemPoolMeter::gb_freed, MemPoolMeter::gb_saved, MemPoolMeter::idle, MemPoolMeter::inuse, memPoolIterate(), memPoolIterateDone(), and memPoolIterateNext(). Referenced by MemImplementingAllocator::alloc(), clean(), MemImplementingAllocator::flushMetersFull(), and memPoolGetGlobalStats(). Definition at line 30 of file Pool.cc. Referenced by Mem::CleanIdlePools(), MemImplementingAllocator::freeOne(), Mem::AllocatorProxy::getAllocator(), memClean(), memConfigure(), MemImplementingAllocator::MemImplementingAllocator(), memPoolGetGlobalStats(), memPoolIterate(), Mem::Report(), and MemImplementingAllocator::~MemImplementingAllocator(). Definition at line 75 of file Pool.cc. Definition at line 101 of file Pool.cc. Sets upper limit in bytes to amount of free ram kept in pools. This is not strict upper limit, but a hint. When MemPools are over this limit, totally free chunks are immediately considered for release. Otherwise only chunks that have not been referenced for a long time are checked. Definition at line 69 of file Pool.cc. Referenced by memClean(), and memConfigure(). Definition at line 171 of file Pool.h. Referenced by create(), MemPools(), and setDefaultPoolChunking(). Definition at line 169 of file Pool.h. Referenced by clean(), MemImplementingAllocator::freeOne(), idleLimit(), memPoolGetGlobalStats(), and setIdleLimit(). Definition at line 170 of file Pool.h. Referenced by create(), memPoolGetGlobalStats(), and MemImplementingAllocator::~MemImplementingAllocator(). Definition at line 168 of file Pool.h. Referenced by MemImplementingAllocator::MemImplementingAllocator(), memPoolIterate(), and MemImplementingAllocator::~MemImplementingAllocator().